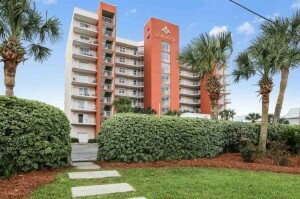 Gulf Shores Alabama beachfront condominium home for sale at Seacrest. This gulf-front property with 615+/- s.f. has incredible views of the sandy white beaches and the Gulf of Mexico. This 1 bedroom resort property has granite counter-tops in the kitchen, a new HVAC system installed in ‘16, new hot water heater, new key-less entry, new balcony door, new bathroom vanity & toilet, and more. This condominium has bunks in the hallway, making it a great real estate investment. Rental income in 2018 = $25,732 as of Nov. 1st. Building was recently painted. WiFi · Hot Tub · Walking Distance to Dining, etc.